When you receive an invitation that looks like this, you just know that the wedding is going to be pretty special. 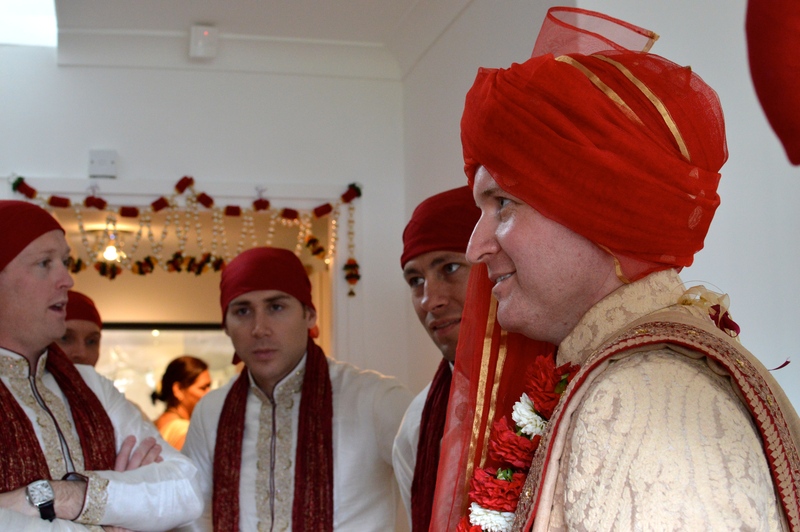 Do you recognise the bride and groom on the front? They’re also found painted on Ritu’s hands with henna (see here). 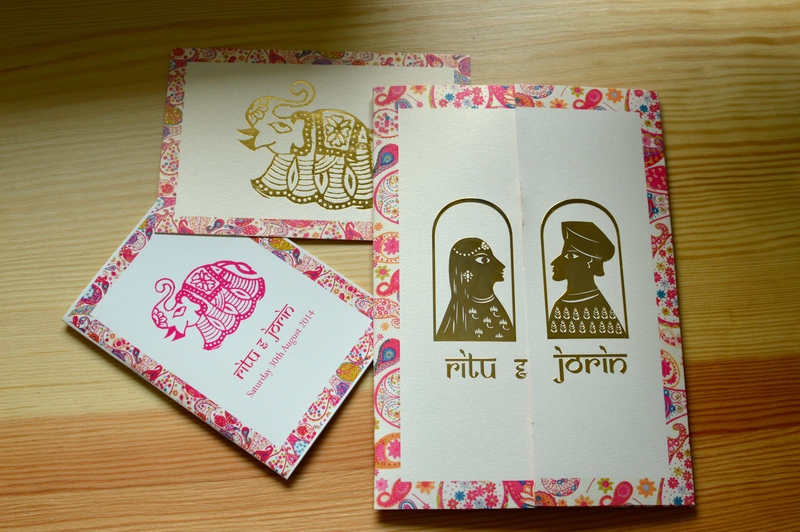 Ritu drew and designed the invitations herself (I KNOW) before getting them printed. The super pretty Liberty print border is the basis for the theme of the civil wedding – you’ll see what I mean a bit later on. 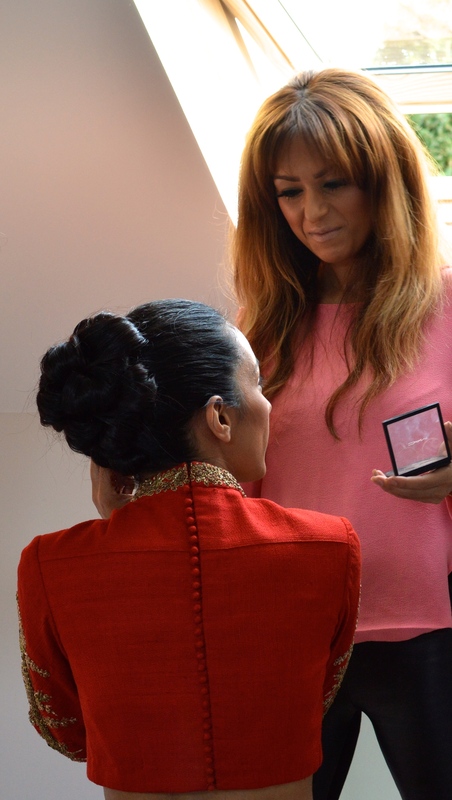 Ritu asked the bridesmaids to be at her house on Saturday 30th August at 8am. I got there at 8.04am, fully ready (I’m talking hair, make-up and even red lipstick), excited for the day ahead. 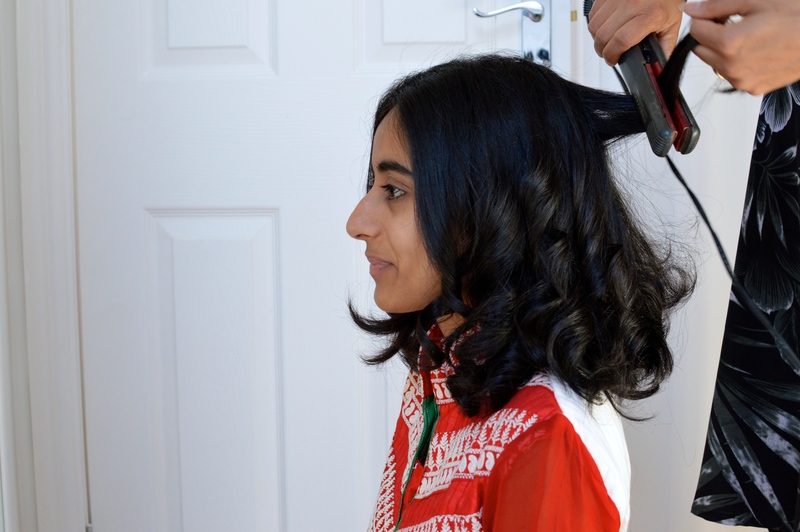 Fellow bridesmaids were already there, in various states of readiness, and Ritu was getting ready with Rani (hair) and Irene (make-up) whilst Sean Elliott (photographer) was already snapping away! 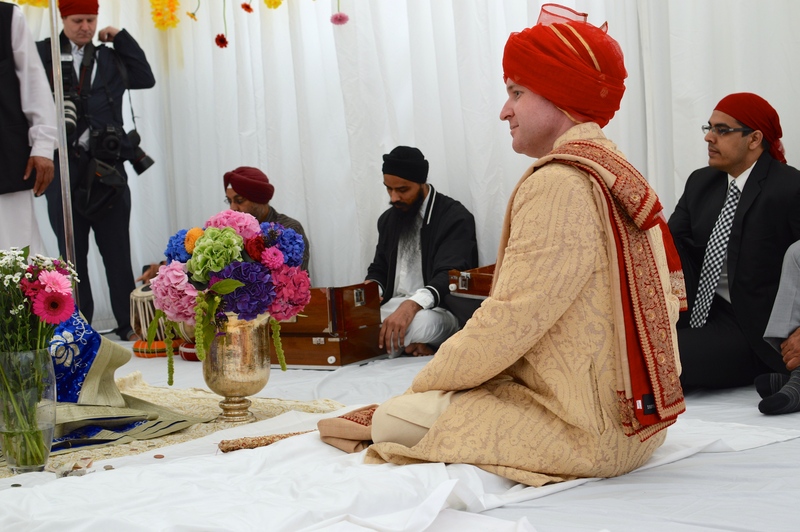 The Sikh ceremony ‘Anand Karaj’ (which means ‘blissful union’) was set to take place at 10am (it has to be before noon), we were running to track. 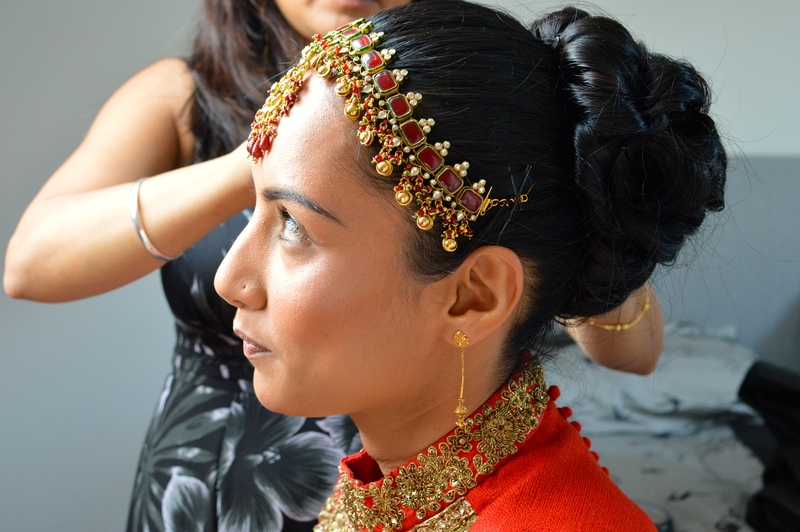 Ritu already looked amazing and this was before her make-up was done. Is it too soon for photos? 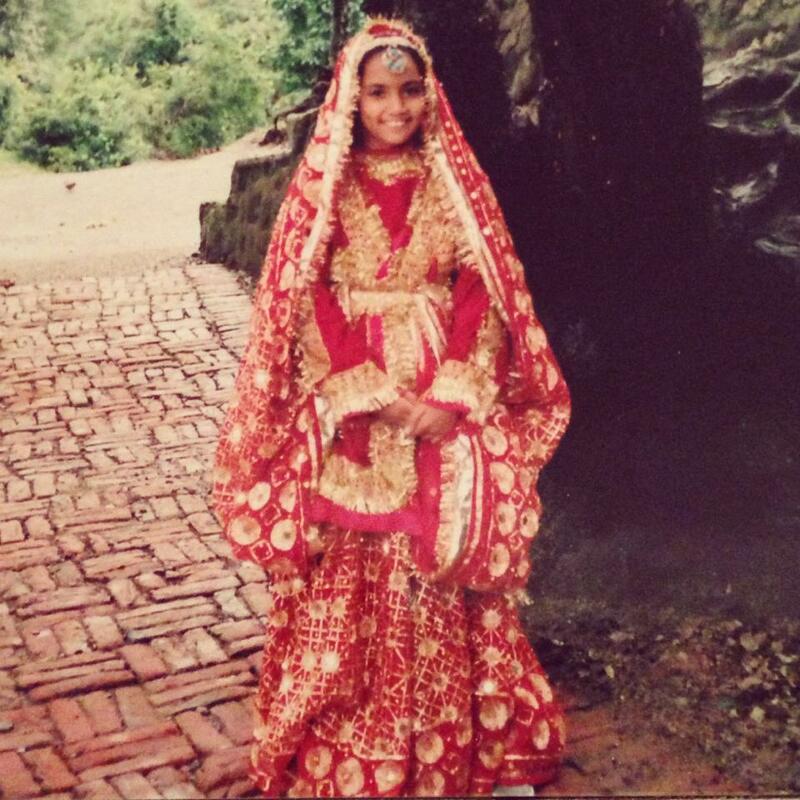 Before sharing photos of Ritu on her actual wedding day, thought it would be cute to share the below snap of her on holiday in Nainital, India in 1990. Gorgeous! Ritu hasn’t actually changed… at all! 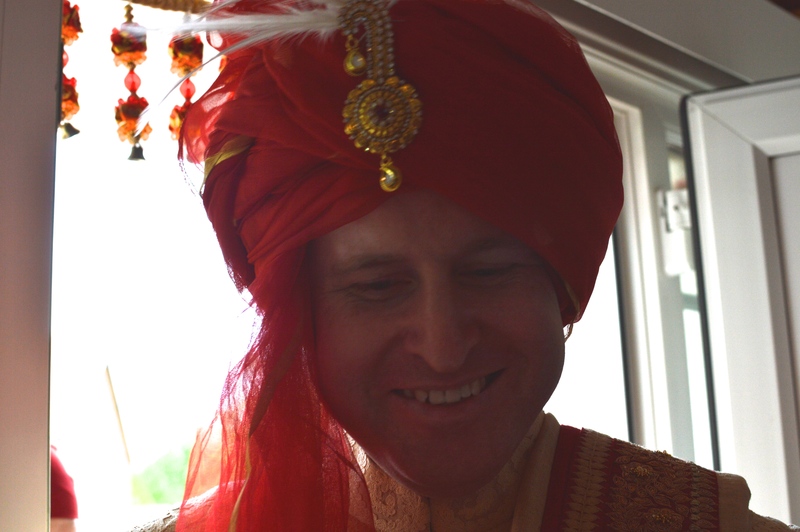 Ok, now for the ‘getting ready’ photos from Saturday morning… Ritu’s outfit for the Sikh ceremony was Sabyasachi from Bibi London. So elegant & entirely different to any wedding outfit I’ve seen before. 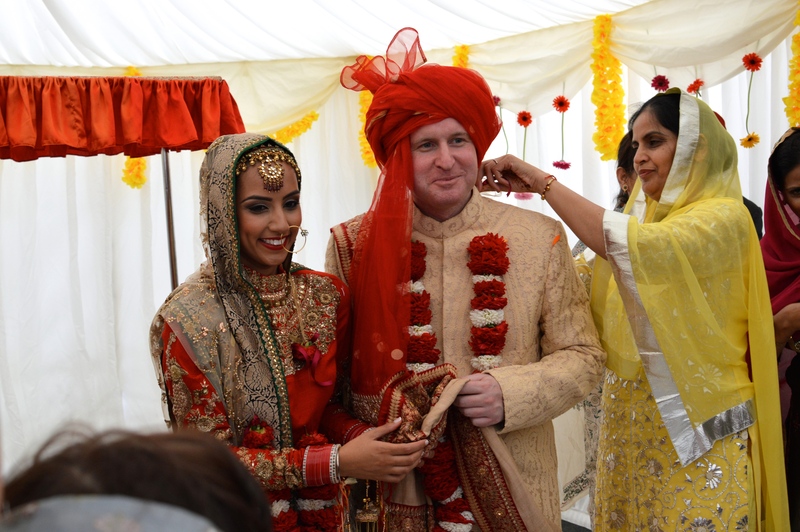 Here’s youngest sister of the bride and bridesmaid, the lovely Jaspreet. 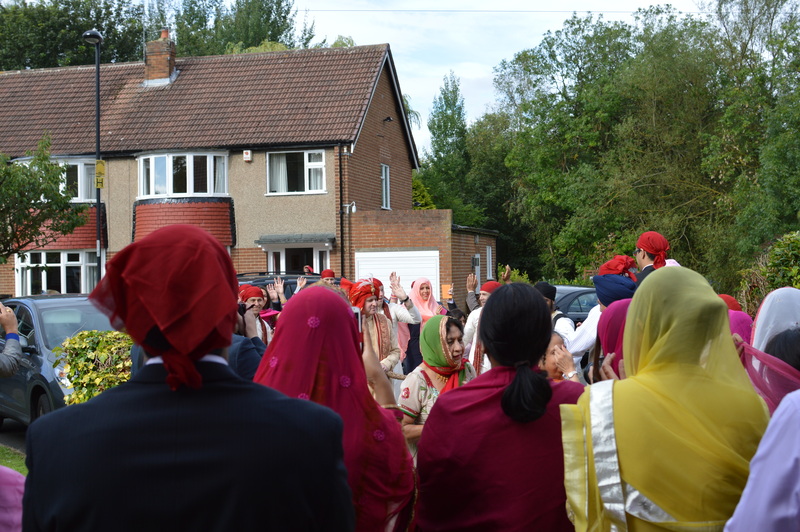 At 10 on the dot, the Gyaniji (priest) arrived with the Guru Granth Sahib (Sikh holy scripture) and we were almost ready to go. 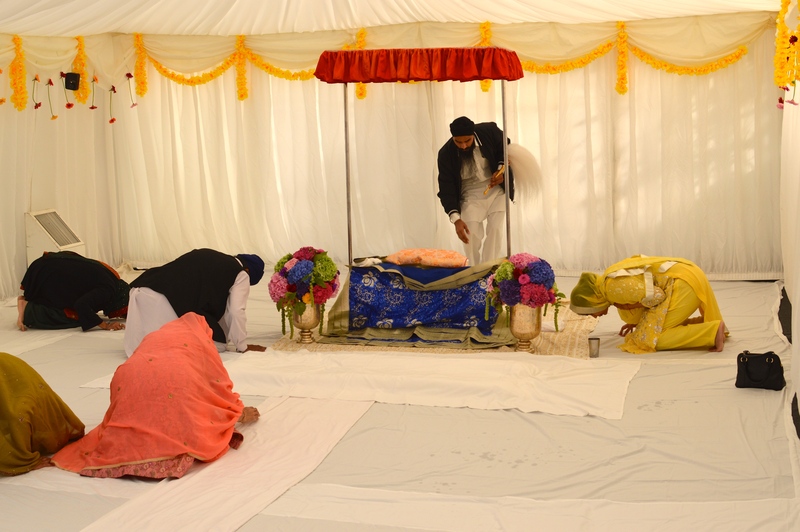 As a sign of respect, all guests bow to the Guru Granth Sahib as they enter the ceremony before sitting on the ground, as well as ensuring that heads are covered at all times (this is very important). 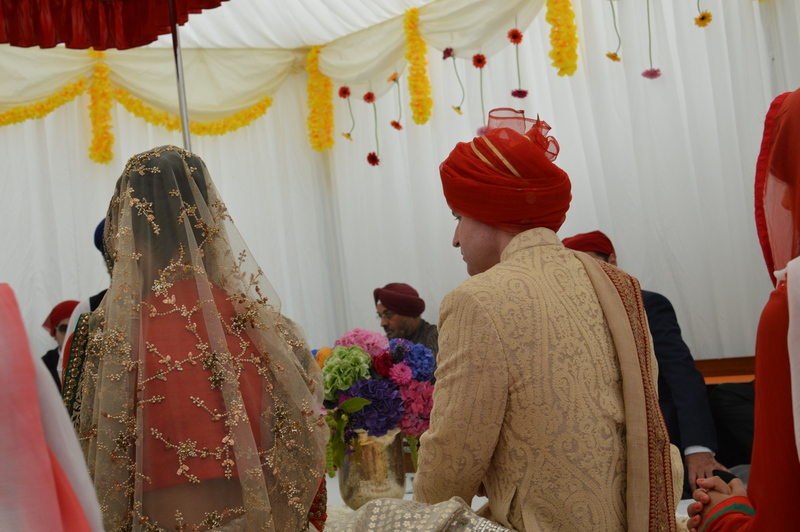 Jorin, groomsmen, family & friends were accompanied to the house by a traditional dhol (drum) player and once they’d been received by Ritu’s family, they entered and were seated ahead of the ceremony beginning. 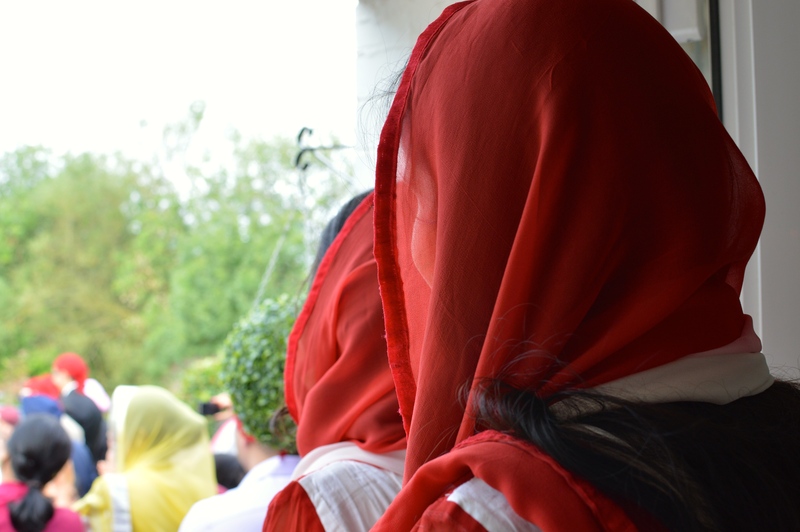 Once we were all seated, heads covered, Ritu made her entrance with her two maternal uncles. 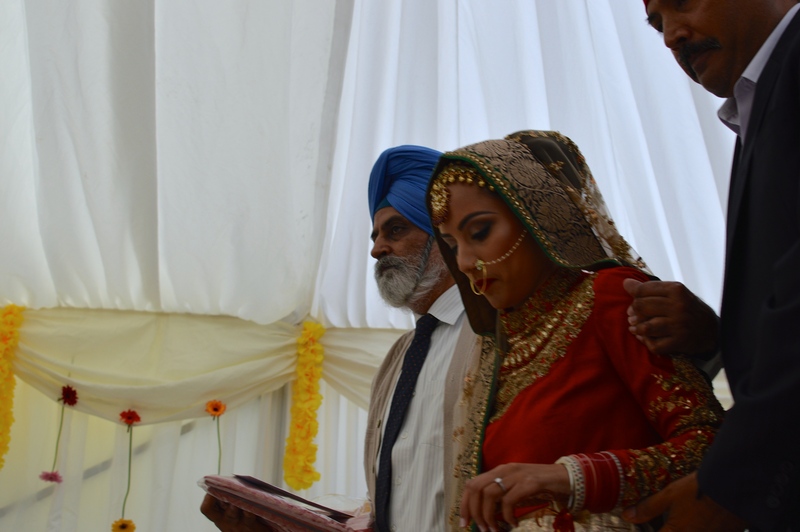 I hadn’t realised Ritu was walking in and only managed to get one photo and it doesn’t do the moment justice. Here it is nonetheless. 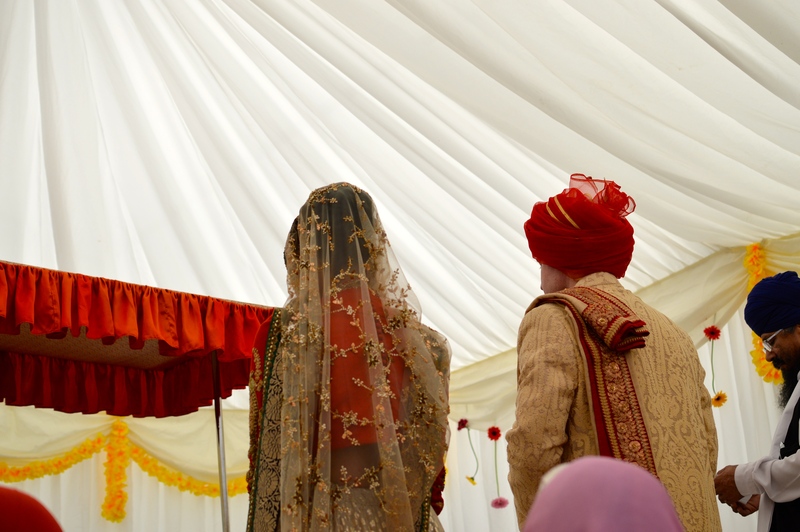 Once Ritu entered, the ceremony began. 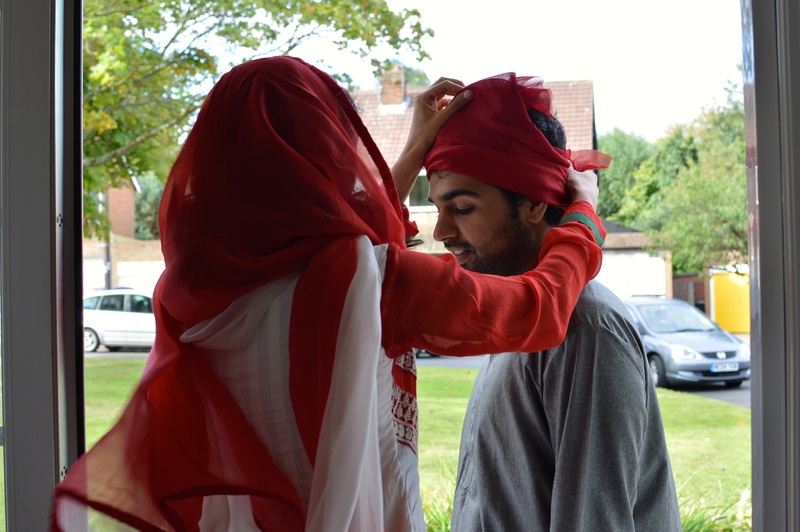 Jorin wore a palla (scarf) over his shoulder and the end of the palla was placed in Ritu’s hands by her uncle – symbolising that the care and protection of Ritu is now placed in Jorin and Gods hands. 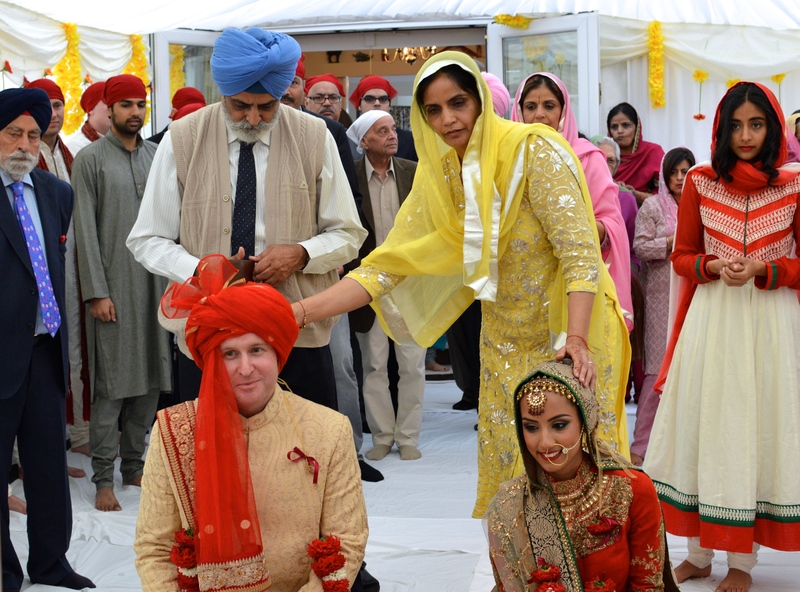 Four laavan (Sikh marriage hymns) are read from the Guru Granth Sahib, after each one the couple rises and walk slowly around the Guru Granth Sahib, Ritu is guided by her brothers as they make the circle around the Guru Granth Sahib. After completing each circle, the couple bow together to show that their understanding and acceptance of the laav and then sit down. Once the fourth Laavan is complete, the hymn of Anand Sahib is read and is followed by Ardaas (closing prayer). 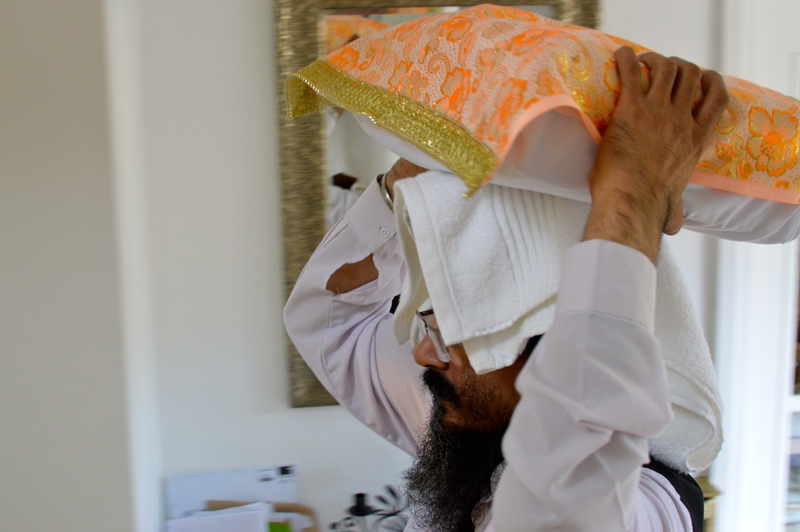 Following the Ardaas, the Guru Granth Sahib is opened to a page at random and a passage from the page is read to serve as a message of guidance for the day. 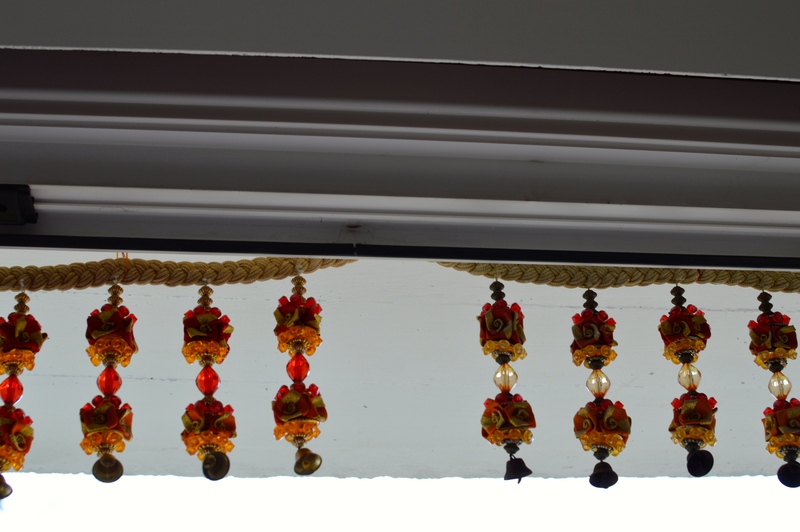 Holy Karah Prashad (a sweet blessing) is served to everyone present. 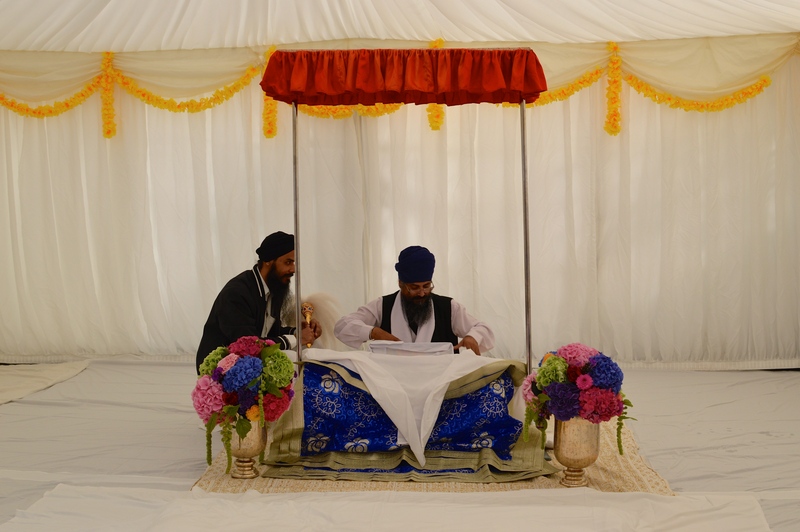 Langar is then served – this is a vegetarian meal served after the religious service. It stands for the principle of equality between all people, regardless of religion, caste, colour, age, gender or social status. 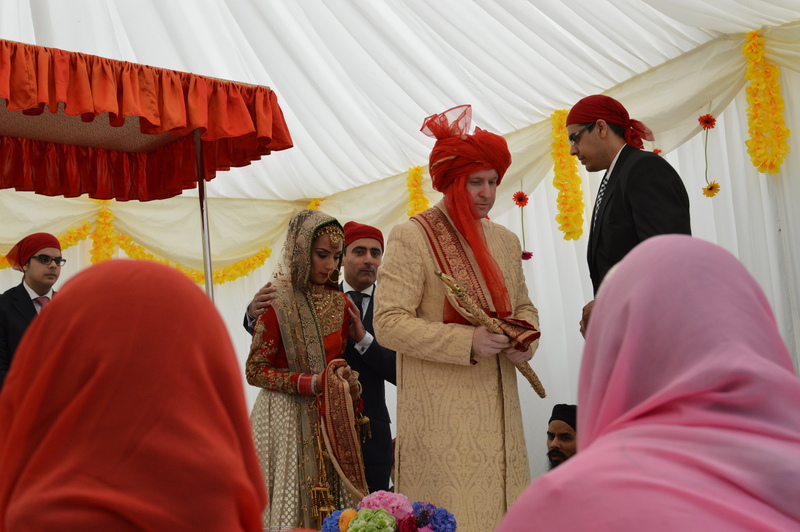 Once everyone had eaten Langar, it was time for photos and then the bride and groom had to make a quick dash to get to Shortflatt Tower for the next part of the wedding day… the civil ceremony (followed by reception!). 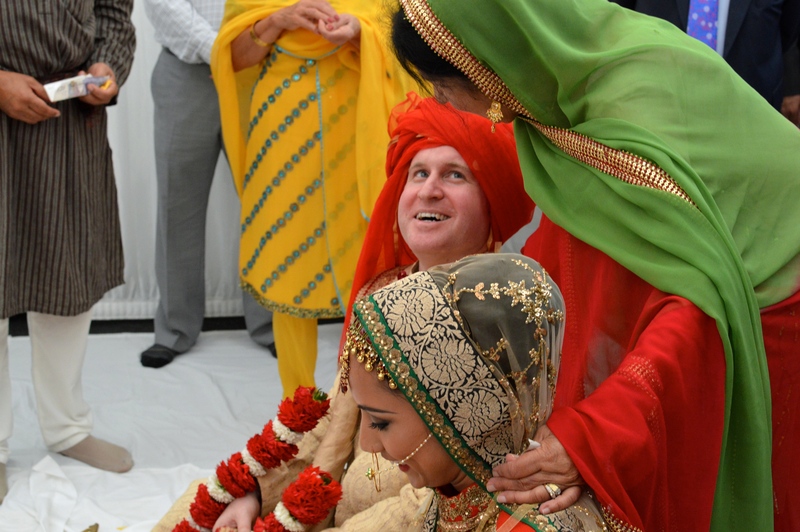 Bridesmaids had the job of getting ready into their next outfits… saris! 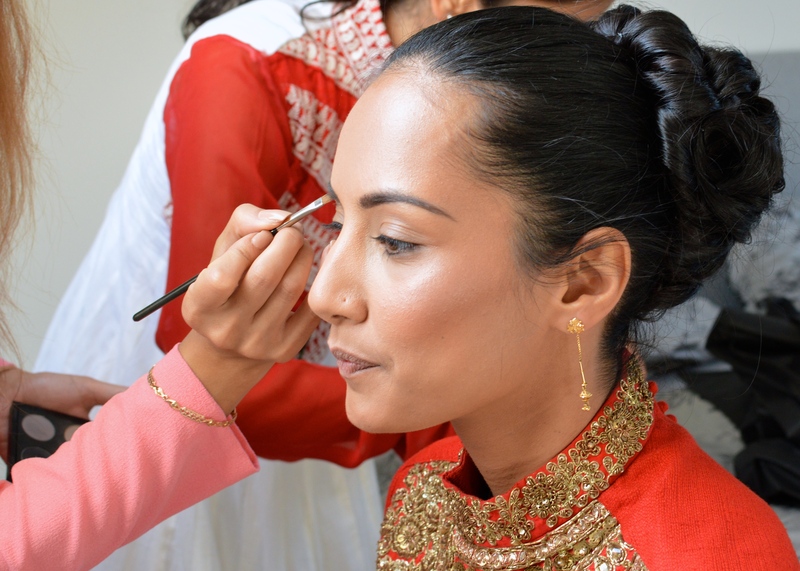 Previous Post Ritu weds Jorin – Pre-Wedding Fun!